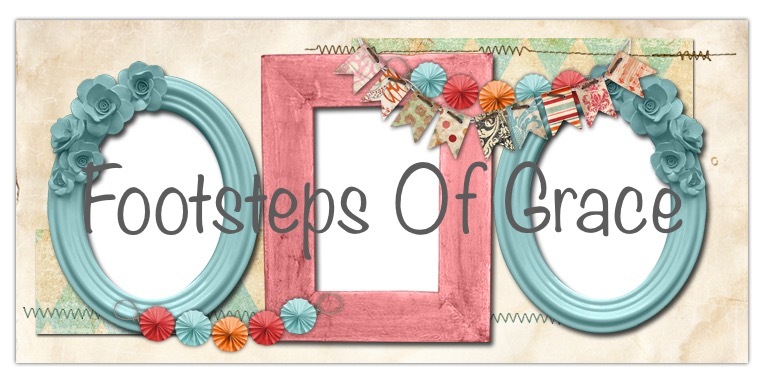 Footsteps of Grace : 22 steps !!!! Wow it's been a busy day today ! I have had quite a bit of company ! Needles to say I am one tired girl this evening ! However today has been more than about company .... Some amazing things happened today ! My sweet hubby came home for lunch today ... He bent down and whispered in my ear and told me God wanted me to him remind me of my favorite verse ! 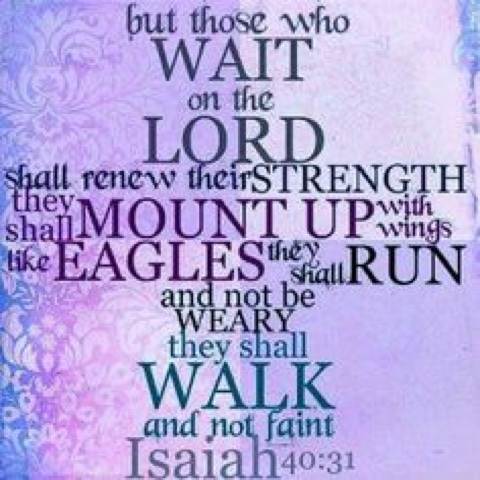 Which is Isaiah 40:31 ! It has been my favorite verse since the day I got saved !!! When my sweet hubby told me that I had a renewed hope !!!! I love when God does that ! So this afternoon I had already made my mind up I was going to try again today even if it was just 3 steps more ! So it was time to start dinner , I have been preparing meals even when if I had to sit in the wheel chair ! However today I wa determined to walk to that kitchen if it killed me lol!!! I am so happy to announce I walked 22 steps and stood and prepared supper all but about 5 minutes of it !!!! I was so excited !!! I was not able to walk back from the kitchen to the chase ... But I made it !!!! My God is good ! Now I must say as well I walked with the assistance of a walker ! I don't care how I got there, I know God helped me get there !!!! I just had to brag about how good He is !!! I am blessed beyond belief! That's a huge progress after 39 days ! It's exactly 10 steps more than I have been able to take ! I still have a ways to go, I still have struggles with my heart and often get short of breathe .... No matter what though !!! I know God has my my healing !!! I praise Him for each and every improvement !!! Because it has only came because of Him !!!! Thanks for your prayers and stopping by !!! I can't wait to share the next improvement with you !!! I'm super excited about tomorrow at the same time it's bitter sweet .... One of my dearest and best friends is coming to visit ... Yet it also means my daughter from another Mom will be going home .... We have loved having her ! I look forward to her coming again soon! Thanks for stopping by Hope you guys have an amazing weekend ... Remember each and everyday is a gift, be sure to find the joy in each day !!! !